The first book introduces the Banks family, consisting of Mr. Banks and Mrs. Banks and their children Jane, Michael, and baby twins John and Barbara. When the children's nanny, Katie Nana, storms out in a huff, Mary Poppins arrives at their home, complete with her traveling carpetbag, blown in by a very strong wind. She accepts the job, and the children soon learn that their nanny, though she is stern, vain, and almost always cross, has a magical touch that makes her wonderful. Among the things Jane and Michael experience are a tea party on a ceiling with Mr. Wigg, a trip around the world with a compass, the purchase of gingerbread stars from the extremely old Mrs. Corry, a meeting with the Bird Woman, a birthday party at the zoo among the animals, and a Christmas shopping trip with a star named Maia from the Pleiades cluster of the Taurus constellation. In the end, Mary Poppins is satisfied with the work she has done with the Banks family, and the West Wind carries her away. Nothing has been right since Mary Poppins left Number Seventeen Cherry Tree Lane. One day, when Mrs. Banks sends the children out to the park, Michael flies his kite up into the clouds. Everyone is surprised when it comes down bringing Mary Poppins as a passenger, who returns to the Banks home and takes charge of the children once again. This time, Jane and Michael meet the fearsome Ms. Andrew, experience an upside-down tea party, and visit a circus in the sky. There is also a new addition to the Banks family with little Annabel. 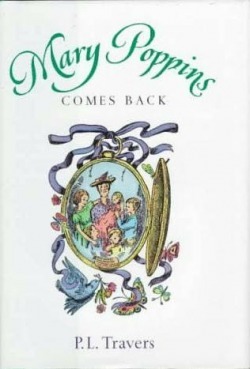 As in Mary Poppins, Mary leaves at the end, but this time with a "return ticket, just in case" she needs to return. On the evening of Guy Fawkes Day, Mary Poppins arrives in the wake of the last fireworks display by the Banks family. The Banks children Michael, Jane, the twins, and Annabel plead with her to stay. She reluctantly agrees to do so "till the door opens". Mrs. Banks has Mary and the children find a piano tuner, who happens to be Mary's cousin, Mr. Twigley. When Mary and the children visit, Mr. Twigley tries to unburden himself from seven wishes given to him when he was born. Besides pianos, Mr. Twigley also specializes in songbirds such as nightingales, one of which he releases when he's finished. He also provides music boxes for Mary and the Banks children to dance to. When they return home later, the drawing room piano is playing perfectly, and when the Banks children ask Mary what happened, she sharply rebukes them. Other adventures in the book include Mary telling the story of a king who was outsmarted by a cat, the park statue of Neleus that comes to life for a time during one of their outings, their visit to confectioner Miss Calico and her flying peppermint sticks, an undersea (High-Tide) party where Mary Poppins is the guest of honor, and a party between fairy tale rivals in the Crack between the Old Year and the New. When the children ask why Mary Poppins, a real person, is there, they are told that she is a fairy tale come true. Finally, the citizens of the town as well as many other characters from the previous two books turn out to say good-bye to Mary. The children realize they're not leaving, but Mary is, and they rush to the nursery window and see her entering a house just like theirs, opening the door, and walking in. Later that evening, Mr. Banks sees a shooting star, and they all wish upon it, the children faintly make out Mary Poppins. They wave and she waves back to them. 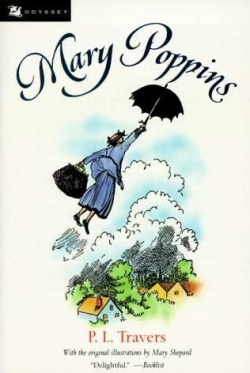 "Mary Poppins herself had flown away, but the gifts she had brought would remain for always." 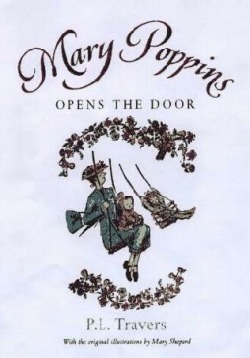 The original 1934 printing of Mary Poppins contained a version of the chapter Bad Tuesday in which Mary and the children use a compass to visit places all over the world in a remarkably short period of time. Because it contained a variety of cultural and racial stereotypes of Chinese, Inuit, Africans, and Native Americans, Travers responded to criticism by revising the chapter in 1981 to include animal representatives instead of people. At the same time, original illustrator Mary Shepard altered the accompanying drawing of the compass to show a Polar Bear at the north, a Macaw at the south, a Panda at the east, and a Dolphin at the west.